There are days when something strikes you and really touches your heart. Yesterday was one of those days. I set out for my last TRIPLE before Hood to Coast. Today I was planning to write a recap of my 3 runs.. .Instead I want to talk about TRANSFORMATION. 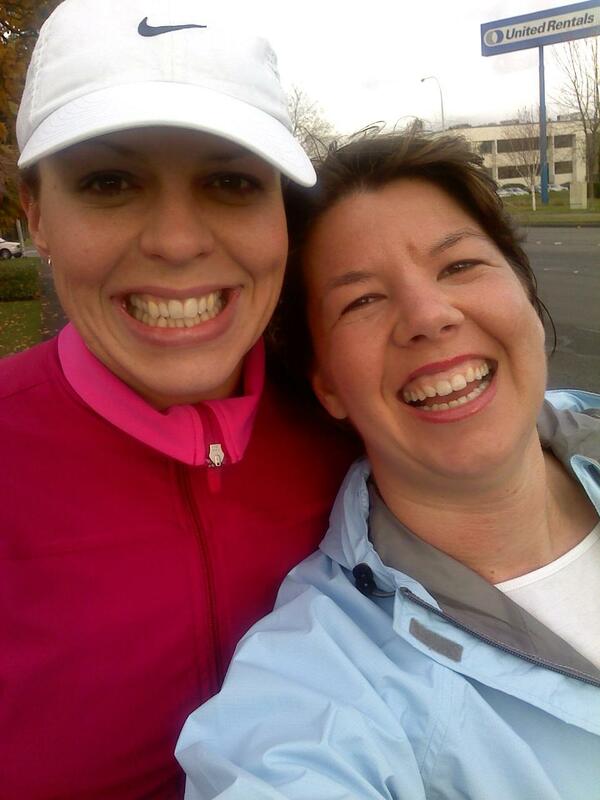 Do you know my friend Kerrie at Mom vs. Marathon HERE? If not, you should. This lady is making GREAT strides with limitless potential and a new found confidence. I clicked around Tall Mom looking for the post about our first run together....I couldn't find it..
What I remember is that Kerrie was AFRAID.. Afraid to run with me, afraid to test her own limits, she was happy and wonderful to be around, but running was not YET her "thing." She has worked through injuries, focused on weight loss and strength gain, and smiled through her FIRST MARATHON.. and guess what?? This lady has had a total TRANSFORMATION.. I drove to Kerrie's Office yesterday to Coach her through a TOUGH Speedwork session. As her Coach I knew that this Tempo Run would be a little daunting. With sub 8:00 pace as the goal for 3 miles, I wanted to make her SWEAT and work HARD to keep her pace. I offered to meet her, and at first she turned me down. I was HAPPY when I got the AM text that she wanted to meet up. SCORE.. Her Recap is funny!! She called my legs "joyful" which is pretty true...I felt GREAT!! I also have a TRANSFORMATION at home!! Muscle Man has always been supportive of my Running. We have raced together and gone on countless Family Runs... he came along to be with me but never seemed fully engaged. But yesterday it HIT ME.. He is a Runner, he wants to Run!!! No longer is he running just to be with me and make me happy. We got up to 10 miles together, him pushing the Little Studs, he raced a 10K and then suffered an injury. This knee injury has made him upset because he WANTS TO RUN!! 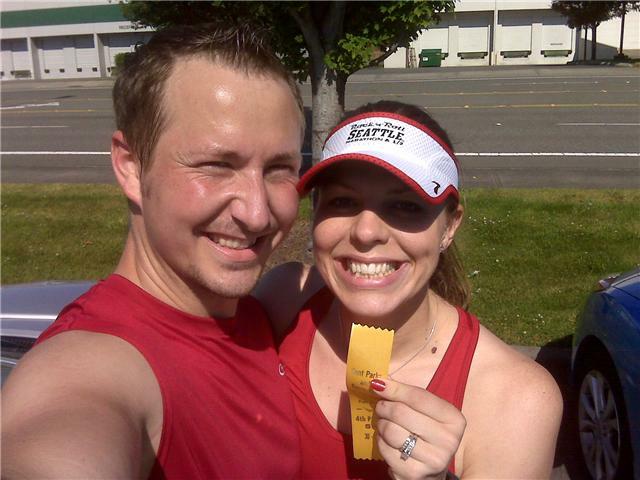 I look forward to Running with my Husband! I am trying to plan what 2012 will look like for my Running.. I go back and forth... To race? To challenge myself? To push my goals aside and BE with my Husband and boys?? These and other TRANSFORMATIONS have changed me too. I am a coach!! I am part of a Runner Couple!! And I am EXCITED!!!!!!!! Tell me about TRANSFORMATIONS you have experienced. Either personal or around you? If you want to follow the Nuun Teams make sure you like Nuun on Facebook HERE and Bloggers Spreading the Nuun Love HERE.. We will have updates, pictures and all sorts of HTC and Nuun fun!! Kerrie has really blown me away this year. It is truly astounding. LOVE your MM has become a runner. It's such a wonderful thing to share. 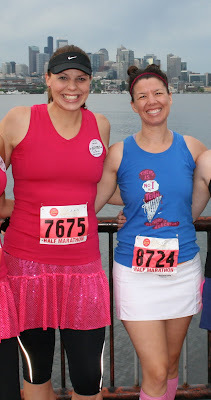 Here's to no more injuries and many miles ahead together - a year of racing or a year of just running with the family? Who says you can't do both? Now I can run 13.1 miles. I have done 22 races and I will run half marathon #3 in 17 days!!!! You are an amazing coach! I feel transformed since training for my last marathon as you as my coach. You believed in me, more that I did myself. When I met the goals you set for me, (which seemed crazy fast and out of reach) I began to look at running differently. Not always about the goal...journey is much more exciting! I will always be thankful to you COACH!! Thank you, Mel. So glad to have you as a coach! And the support of lots of people. 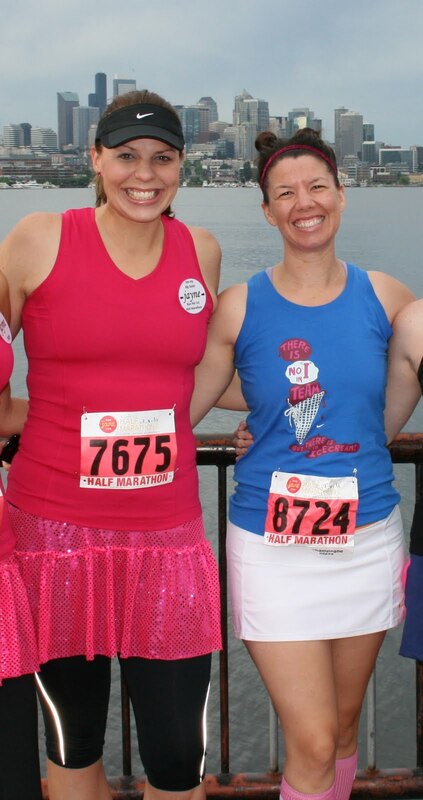 The running community has been a big part of my transformation! Hugs! So awesome about your husband :) and Kerrie! Lots of transformations in my lifetime :P I'd say motherhood was the most dramatic. And I'd say into an athlete was the most subtle... and I still don't always 'feel' it... especially now! very cool about you and the hubby :) My husband and I will be running our first half marathon TOGETHER on our anniversary, January 15! We are EXCITED and both can call ourselves "runners"...I guess?! Transformation: I lived a life of shame, embarrasment and lack of confidence. Although I was "popular", my self esteem was NOT something to be admired. I changed my life in 2001 and never looked back. At that moment I told myself I'd NEVER go back to that place, EVER and I haven't! I have support from my husband who also TRANSFORMED in 2009 and has become an AMAZING runner and active Dad and husband! Hm, guess that word means SOOOOO much to me...too much to write!! Kerrie has had an amazing transformation!!! It is so awesome to see how many people you have inspired to push themselves further than they ever thought they could go!!! Kerrie is really doing awesome...I can't believe the transformation! She is also lucky to have such a wonderful friendship and support! I hope I can follow in her footsteps with those times one day!!! I just wrote on Kerrie's wall that it was so inspiring to see the pictures of her on your blog! You are such a good friend to spotlight her! I can't wait to have my "after" picture! I am in the process of transforming myself from a couch potato to a runner!! I so wish my husband would run with me!! Happy that MM will join you! If you are interested, I have a virtual 5k on my new blog. Old one was Running After Violet! Love the realization about the hubs. Awesome! Mine hates running... he's a tennis guy, and I can't get him to race at all. The transformation I'm working on is my friends - I think I have sucked in almost every single one of my friends... to the point where I don't even think anyone I talk to anymore hasn't been transformed into some sort of runner. It's greatness! you are amazingly inspiring - but i'm sure you hear that all the time. if only i lived closer, i'd want you to be my coach in a heartbeat!! !